Crow: Joel, I hate movies where the men wear shorter skirts than the women. Run Time: Approx. 360 min. Anyway, luckily the show lives on in digital format, thanks to the efforts of Rhino. To date, the company has released over 30 episodes on individual discs and in box sets, and scrounged up some nice extras as well. The latest edition, The Mystery Science Theater Collection: Volume 7, is an odd grab bag of four episodes, but still sure to please die-hard MSTies. Note that the nature of the show makes it difficult for any episodes to be released at all, since the rights to the movies riffed upon were originally negotiated for television airing only. So I'll take what I can get. Which is easier, incidentally, when I can get one of my very favorite episodes. This set includes Season Four's The Killer Shrews, a hilariously awkward 1959 creature feature from B-movie maven Ray Kellogg (the extra "G" is for "Guh?"). Joel, Crow, and Tom Servo are as dumbfounded as I am by the plot, which strands a group of scientists on an island with mutated killer shrews (the shrew, opening monologue insists, is one of the most fearsome animals in nature even pre-mutation, which... right, whatever you say, Mr. Narrator), particularly since the lethal monsters are obviously fuzzy puppies covered in felt (Tom: "Are the dogs and the shrews friends? Is that what's going on?"). Preceded by the short Junior Rodeo Daredevils, in which kindly old timer Billy Slater forced poor, defenses children onto the backs of bucking farm animals (Tom: "Rodeos are the opiate of the masses."). Next are two of the three Hercules films MSTed in Season Four: Steve Reeves starrer Hercules Unchained and Alan Steel-flavored Hercules Against the Moonmen. Both movies are the perfect fit for the show, meaning big, weird, broad, and colorful, and not without many opportunities to make jokes about guys in skirts. While I would have liked a little more variety, both of these are very funny episodes, and the latter includes on of my favorite host segment songs ever ("Pants! Pants! Sing the praises of pants! Nothing better shows my taste than what I wear below my waist, hey, pants!"). The odd man out comes from Season Eight. Prince of Space is a Japanese oddity from 1959 that deals with a space invasion by a race of weaselly, irritating bird-like men and, as all Japanese movies of the period, little boys in disturbingly short shorts. Many MSTies really seem to love this one, and while I admit Mike and the Bots get in some good licks against the primary villain, The Phantom of Krankor (who inspired Crow's quip, "I LIKE IT VERY MUCH!" which eventually wound up on a fan club bumper sticker, I believe), the movie in this one is a little too bad for me. It doesn't help that it's in muddy black and white with a shrill dub. Still, it's MST3K, which means it's funny (aside from the generally lame Sci-Fi era host segments). All in all, not a bad set. You never know which MST3K release could be the last, so enjoy the savory goodness while you can. I LIKE IT VERY MUCH! Image Transfer Review: The movie segments vary in quality (it's not like they should look good), but the host segments are crisp and bright, though obviously from a low-budget production. Audio Transfer Review: As always, the show is presented in basic stereo that works out nicely�the quality of the movies' soundtracks varies, but Mike and the bots always come through clearly. 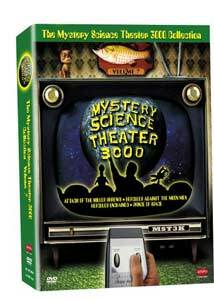 Extras Review: When it comes to the MST3K DVD releases, extras are always an unexpected surprise�the nature of the series somewhat limits the amount of material available. For a little while, host Mike Nelson was producing introductions for each episode, but for this collection, we're limited to a trio of short films with commentary from the crew of the SOL, all found on the same disc as The Killer Shrews. The first two, A Case of Spring Fever and Century 21 Calling aired during the show's run on Sci-Fi, which doesn't bode well for the episodes they accompanied (Squirm and The Space Children) ever coming to DVD. They're both very memorable. The former features an animated talking spring that shows a man what the world would be like without springs. I'm reminded of the episode of The Simpsons in which a man tries to commit suicide because he can't deal with the horrors of a world without zinc ("Even the firing pin in that gun was made of... zinc!"). Century 21 Calling is almost as weird. It has something to do with modern innovations in telephone technology, but don't quote me on that (marvel at the ultra-futuristic "bellboy" telephone pager, only as large as one of today's larger models of laptop. Ah, oooo, new "touch tone" dialing!). The real bonus, though, is the so-called "lost" short Assignment: Venezuela, a 24-minute segment originally slated to appear on the never-released MST3K CD-ROM in about 1995 (which is just as well, I suppose, since the program would probably be obsolete by now anyway... and really, how long has it been since you've heard anything about a "CD-ROM"? Might as well be talking about a record album.). The longish short is pretty funny�Mike and the bots mock a stodgy bit about an American engineer being sent to manage a manufacturing plant in South America. Unfortunately, there is a time stamp at the top of the screen throughout, at least on my screener copy. Though previous sets have had more extras the grade gets a bump this time because most MSTies thought the Venezuela short would never seen an official release outside of the VHS from the fan club. Though a rather odd assortment of episodes, The Mystery Science Theater Collection: Volume 7 includes a fan favorite (Prince of Space), two campy Hercules flicks (and yes, I also hate movies where men wear shorter skirts than the women, particularly when Brad Pitt did it in Troy, because... never mind), and a personal favorite, Killer Shrews, or "Look what we glued to the dog!" Buy it, love it, and "keep circulating the (discs)." In a non-piracy way, of course.